Mostly just entertaining banter between the two. DK auditioned for Megatron and Lugnut in Animated, but got Optimus instead. It took a while to get used to being Optimus instead of Megatron. 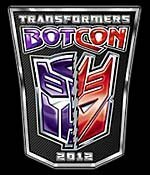 GC auditioned for BW Megatron, but got Optimus instead. Neither was considered for the current series (TFPrime)... however...(SPOILER) DK hinted at being invited to do a cameo role on TFPrime... who could it be? The inspiration for BW Megatron was apparently a combination of Sean Connery, Anthony Hopkins & a lizard. They also talked about Alec Willows, who did Tarantulas, and how he put himself into playing the part. The cartoon Exosquad was the first time they worked together, before Beast Wars. Garry wants to eventually play a Megatron, because evil is more fun. He mentioned auditioning for BW Megatron.